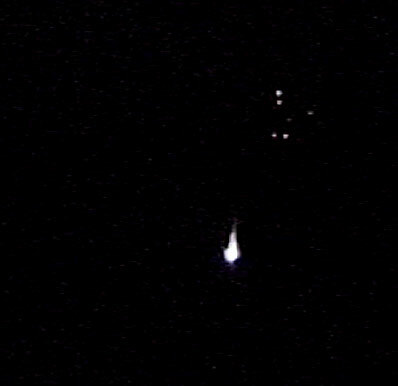 With a flash of blinding light, a $45 million replacement craft began its thunderous trek toward the U.S. military's Global Positioning System constellation Sunday morning aboard a Boeing Delta 2 rocket. The 126-foot-tall booster departed its frigid Florida launch pad at 3:05 a.m. EST (0805 GMT). The mission was delayed 15 minutes after an alarm sounded, prompting engineers to review the situation before resetting the countdown clock for liftoff at the very end of the day's available launch window. After a 68-minute ride atop the three-stage launcher, the GPS 2R-10 spacecraft was deployed into a temporary orbit around Earth. "Our Delta team has done an outstanding job in supporting the customer, by providing absolute mission assurance," said Dan Collins, vice president and general manager, Delta Programs, for Boeing. The satellite will fire an onboard solid-fueled motor later this week to reach its perch 11,000 miles above the planet. By mid-Janauary, the Lockheed Martin-made craft should be fully tested and ready to join the GPS network. GPS satellites send continuous navigation signals that allow users around the world to find their position in latitude, longitude and altitude and determine time. The signals are so accurate that time can be figured to less than a millionth of a second, velocity to within a fraction of a mile per hour and location to within a few feet. The constellation is relied upon heavily by U.S. military forces, helping guide aircraft, ships, troops and precision bombs. "As recently as Operation Red Dawn when our Army's 4th Infantry Division pulled Saddam Hussein from his spider hole, GPS satellites have played a key role as an enabler of today's American and coalition war fighting capabilities," said Capt. Andy Wulfestieg, chief of GPS operations section at Air Force Space command. Citing a story recently told to him by an Army major, Col. Allan Ballenger, the Air Force's system program director for the NAVSTAR GPS Joint Program Office, said the navigation network helps the military "make life and death decisions each and every day." "His job over in Afghanistan was leading the team sweeping for mine fields. In this particular example, they are able to go in and plot where bad places are and good places are." This newest satellite is the first to feature an advanced antenna panel to increase power for GPS receivers. It replaces an old model spacecraft in the constellation that has surpassed its design life and suffers from a solar array drive problem, officials noted. GPS 2R-10, also known as SVN-47, will fill the Plane E, Slot 2 position in the GPS network. It takes over for GPS 2A-10 launched on November 26, 1990. 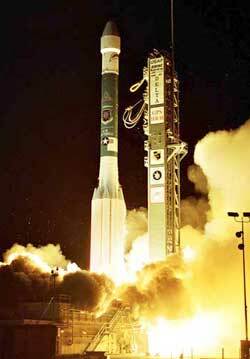 This was the third launch in 2003 to sustain the GPS fleet, with four more planned next year. The first is expected in March. There are eleven more 2R-series satellites waiting to fly, eight of which have been modernized with two new military signals and a second civil signal to improve capabilities for users. The first modernized craft is slated for launch at the end of 2004. "The GPS 2R program is a great example of how teamwork and technology come together to provide a wide range of military and civilian uses for navigation and precision-timing applications," said Dave Podlesney, Lockheed Martin's GPS 2R program director. "We take great pride in achieving mission success for our Air Force customer and look forward to delivering another high performance spacecraft to our men and women in uniform, as well as for civil, scientific and commercial users around the globe." The GPS network features 24 primary satellites split into six orbital planes with four spacecraft in each. Some planes also have additional satellites to enhance coverage and serve as backups. The orbiting system currently has 28 craft in service, the Air Force says. "The health of the constellation is excellent. With the addition of GPS 2R-10, we will continue to provide tremendous navigation and targeting capabilities critical to our warfighters around the world," Col. Ballenger said.